Climb on board with us, visit Olympia and meet with your legislators! 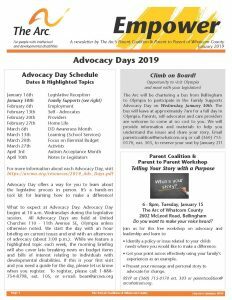 The Arc of Whatcom County will be chartering a bus from Bellingham to Olympia to participate in the Family Services Advocacy Day on Wednesday, February 7th. The bus will leave at approximately 7am for a full day in Olympia. Parents, self-advocates and care providers are welcome to come at no cost to you. We will provide information and materials to help you understand the issues and share your story. Please email parentcoalition@arcwhatcom.org or call (360) 715-0170, ext. 303, to reserve your seat today! Information on the Washington State Legislature. 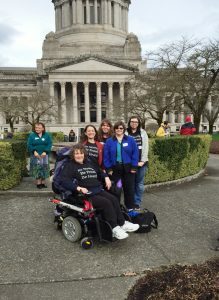 Washington State Developmental Disabilities Council members plan comprehensive services for the State of Washington’s citizens with developmental disabilities. Social Security delivers a wide range of services online that include regional offices, field offices, card centers, teleservice centers, processing centers, hearing offices, the Appeals Council, and our State and territorial partners, the Disability Determination Services. The Division of Vocational Rehabilitation helps individuals with disabilities participate fully in their community and become employed. 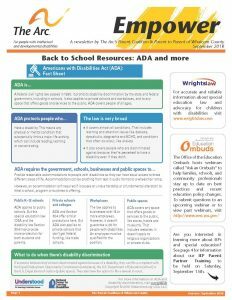 The Developmental Disabilities Administration assists people with developmental disabilities and their families to obtain services and supports based on individual preferences, capabilities and needs.